• How can a long metal needle pass through a balloon without popping it? • How can water flow at very different rates through two identical funnels? • How can a stick, placed on a table under several sheets of newspaper and extended over the edge of a table, snap when quickly struck—without lifting or tearing the paper? 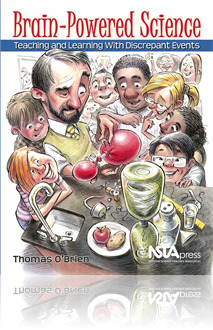 Author Thomas O’Brien takes these and 30 more science inquiry activities to a higher level in this book for educators who love to surprise and challenge their students with unanticipated results. Using experiments based on the science of a “discrepant event”—an experiment or demonstration in which the outcome is not what students expect—O’Brien shows how learners can be motivated to reconsider their preconceived notions and think more closely about what has actually occurred and the underlying scientific explanations. What makes this volume more valuable than a mere activity book is the addition of a science education component to the extensive science content found in each activity. Each discrepant event is shown to be analogous to a pedagogical principle. Speaking directly to teachers, O’Brien writes: Your participation as teacher-as-learner-experimenter (rather than simply passive reader) in these minds-on activities will lead you to question, and help you to revise, your implicit assumptions about the nature of science, teaching, and learning. At the same time, you will develop expertise with activities that you can use with your own students. The dual-purpose activities thus allow you to unlock two doors with one key—the doors to your own learning and to your students’ learning. The detailed analogies between the activities and science learning make the book an ideal resource for middle and high school teachers, science teacher educators and their preservice students, and professional development specialists alike. This thorough and thought-provoking text includes more than 200 up-to-date internet resources, as well as extensions to each of the physical science, biology, and chemistry activities—bringing the total number of inquiry activities to nearly 120. Most important, the author reminds teachers that the study of science is full of surprises and should be both meaningful and fun for students.